The fourth quarter of 2018 was the beginning of the end of the longest bull market in history. It had to be because I heard it on the television. The market was certainly stunned in the last part of 2018, but that defeat was neither final nor lasting. As we have long said, an accommodative Fed behind a sound financial system, matched with healthy corporate earnings growth, should prevent a market meltdown regardless of bad news and jittery investor nerves. As the graph below depicts, domestic stocks regrouped from the fourth quarter rout in respectable fashion, closing the first quarter near all-time highs. 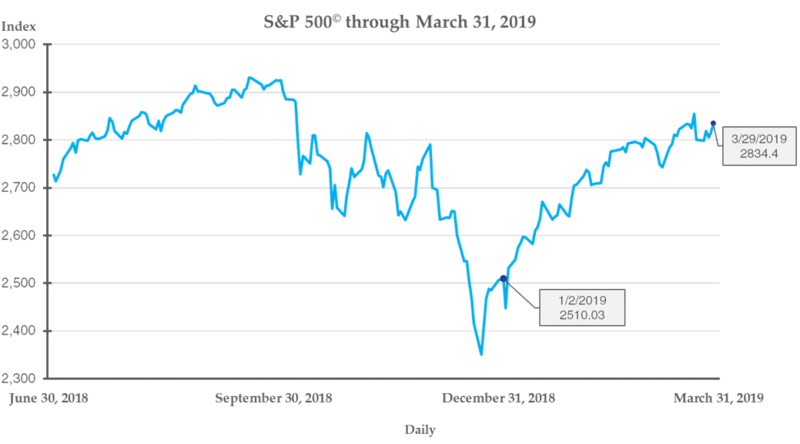 For the quarter ending 3/31/2019, the S&P returned 13.7%, almost a mirror image of the losses seen in the previous quarter. The Federal Reserve’s influence on the market cannot be overstated. The rest of the world is struggling to grow, tariffs are still on the table, Brexit is a never-ending drama, and earnings growth is cooling from its epic 2018 highs. Despite this fog of war setting, financial markets have been able to move smartly forward with some not-so-gentle nudges from the Fed. The Federal Open Market Committee has removed its foot from the brakes of the economy and has seemingly committed to remaining accommodative. Easy monetary policy, within reason, should help companies borrow at low rates, can have a virtuous effect on overseas markets, and can provide wind to the sails of the stock market. However, if, as some prognosticators are still concerned, inflation is waiting in the wings, the Fed will likely switch tactics and resume its tightening regime. Some investors have gone so far as to price interest rate cuts into their assumptions in 2019. If the Fed does not end up cutting rates, this could have a chilling effect on the financial markets. If it decides to raise rates, the effect could cause outright frost bite. A lot of the same concerns we shared with you late last year and in the two paragraphs above still exist. The two that are most imminent are Brexit and earnings. As we shared with you in our last issue, Brexit could have a major impact on Europe if it ends poorly. What we haven’t updated you on in a while is corporate earnings, the engine of stock prices. There is good and bad news on that front. The bad news is that earnings are expected to decelerate in the first quarter. The good news is that earnings growth expectations are low, and outperformance of those prospects will not require Herculean efforts by companies. Even with the recent rally, we are still constructive on risk assets, but we will be modestly reducing any overweighting to them over the balance of this year. In closing, several colleagues and I had an opportunity to spend a few days in Mexico celebrating the wedding of Mike Zambelli, Cornerstone’s Director of Participant Services and Jessica Link. Mike could not have suffered his final defeat of bachelorhood to a better person. We all had a great time and wish Mike and Jess nothing but the best in their life together. Thank you, as always, for reading this edition of Independent Insights. Kevin is Cornerstone’s Chief Investment Officer and is involved with the firm’s Investment Policy and Strategic Planning committees. Kevin joined the company in 2000 after graduating from Lehigh University with a B.S. and M.S. in Economics and earned his CFA charter in 2005. Kevin and his wife Kat support many charitable causes and have established a donor advised fund to propagate their philanthropic interests. They live in Bethlehem with their two cats: Zola and Charlyne, enjoy woodworking, gardening, reading and travel. Kevin is the proud uncle to many nieces and nephews and loves spending time with and spoiling them. This material is prepared by Cornerstone Advisors Asset Management, LLC (“Cornerstone”) and is not intended to be relied upon as a forecast, research or investment advice, and is not a recommendation, offer or solicitation to buy or sell any securities or to adopt any investment strategy. The opinions expressed are as of the published date indicated on the article and may change as subsequent conditions vary. The information and opinions contained in this material are derived from proprietary and nonproprietary sources deemed by Cornerstone to be reliable, are not necessarily all inclusive and are not guaranteed as to accuracy. As such, no warranty of accuracy or reliability is given and no responsibility arising in any other way for errors and omissions (including responsibility to any person by reason of negligence) is accepted by Cornerstone, its officers, employees or agents. This material may contain ‘forward looking’ information that is not purely historical in nature. Such information may include, among other things, projections and forecasts. There is no guarantee that any forecasts made will come to pass. Reliance upon information in this material is at the sole discretion of the reader. The information is provided solely for informational purposes and therefore should not be considered an offer to buy or sell a security. Except as otherwise required by law, Cornerstone shall not be responsible for any trading decisions or damages or other losses resulting from this information, data, analyses or opinions or their use. Please read any prospectus carefully before investing.